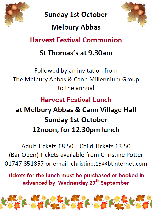 On Sunday 1st October Melbury Abbas celebrate Harvest Festival with a Harvest Festival Communion at St Thomas's Church at 9.30am. This will be followed by the annual Harvest Festival Lunch hosted by the Melbury Abbas and Cann Millennium Group, at Melbury Abbas and Cann Village Hall, on Sunday 1st October at 12noon, for 12.30pm lunch. (The bar will be open). Next article:Little Fishes is up and running!